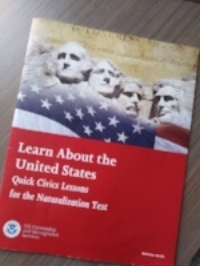 This 4th of July, I am studying for my U.S. citizenship test. For a little fun, here are a few of the questions from the study guide. Do you know the answers? 1. When was the Declaration of Independence adopted? 2. Name one of the two longest rivers in the United States. 3. How old do you have to be to vote for the President? 4. How many amendments does the Constitution have? 5. What territory did the United States buy from France in 1803? Bonus Question: When do we celebrate Independence Day? Hope you have a Happy and enjoyable 4th!